Frances (Fanny) Dickens, the daughter of John Dickens and Elizabeth Dickens, was born at 13 Mile End Terrace (now 393 Old Commercial Road), Landport, in August 1810. Two years later, her brother, Charles Dickens, was born. Dickens worked at the Navy Pay Office in Portsmouth. He was later transferred to London and the family found lodgings in Cleveland Street. Dickens was now earning £200 a year. However, he always had trouble managing money. He liked to dress well, enjoyed entertaining friends and bought expensive books. Dickens was in debt and had to ask for loans from family and friends. In April 1816, a fourth child, Letitia, was born. Seven months later John Dickens was sent by the Navy Pay Office to work at Chatham Dockyard. Dickens rented a house at 11 Ordnance Terrace.Dickens' slary continued to grow and by 1818 he was earning over £350 a year. He still could not manage and in 1819 he borrowed £200 from his brother-in-law, Thomas Barrow. When he did not pay the money back, he told him that he would not have him in his house again. The family finances were not helped by the birth of two more children, Harriet (1819) and Frederick (1819). In 1822 John Dickens returned to work at Somerset House in London and the family moved to Camden Town. The following year Fanny was awarded a place at the Royal Academy of Music in Hanover Square. She was to study the piano with Ignaz Moscheles, a former pupil of Ludwig van Beethoven. The fees were thirty-eight guineas a year, an expense that they family could not really afford. One of the consequences of this decision was that her younger brother, Charles Dickens, was denied an education. Claire Tomalin , the author of Dickens: A Life (2011), has argued: "Dickens maintained that he never felt any jealousy of what was done for her, he could not help but be aware of the contrast between his position and hers, and of their parents' readiness to pay handsome fees for her education, and nothing for his. It is such a reversal of the usual family situation, where only the education of the boys is taken seriously, that the Dickens parents at least deserve some credit for making sure Fanny had a professional training, although none for their neglect of her brother." Dickens' friend, John Forster , commented: "What a stab to his heart it was, thinking of his own disregarded condition, to see her go away to begin her education, amid the tearful good wishes of everyone in the house." In February 1824, John Dickens was arrested for debt and sent to the Marshalsea Prison in Southwark. Charles was used by his father as a messenger to carry his requests for help to family and friends. He already owed these people money and no one was willing to pay the money that would free him from capitivity. Dickens later told John Forster: "My father was waiting for me in the lodge, and we went up to his room (on the top story but one), and cried very much. And he told me, I remember, to take warning by the Marshalsea, and to observe that if a man had twenty pounds a year, and spent nineteen pounds nineteen shillings and sixpence, he would be happy; but that a shilling spent the other way would make him wretched. I see the fire we sat before now; with two bricks inside the rusted grate, one on each side, to prevent its burning too many coals." Although only twelve years old, Charles was now considered the "man of the family" and was given the task of taking the books that he loved to a pawnbroker in the Hampstead Road. This was followed by items of furniture, until after a few weeks the house was almost empty. Eventually, Elizabeth Dickens decided to join her husband in Marshalsea Prison with the smaller children." On 29th June 1824, Fanny performed at a public concert at which Princess Augusta, the sister of King George IV , presented the prizes. Charles Dickens later recalled: "I could not bear to think of myself - beyond the reach of all such honourable emulation and success. The tears ran down my face. I felt as if my heart were rent. I prayed, when I went to bed that night, to be lifted out of the humiliation and neglect in which I was. I had never suffered so much before." Dickens added unconvincingly, "There was no envy in this." In February 1827, John Dickens was once again, deeply in debt. Fanny's fees at the Royal Academy of Music were so badly in arrears that she had to leave; but she showed such promise and determination that she was able to make an arrangement which allowed her to return and pay for her studies by taking on part-time teaching. During this period she was described as someone who had "natural buoyancy of spirits and fondness for society". She was also said to be self-reliant "in no ordinary degree - together with almost restless activity and practical energy". In 1834 Fanny was awarded an associate honorary membership at the Royal Academy. She was a talented singer and took part in public concerts. In 1835, Catherine Hogarth described Fanny as "a very pretty girl who sings beautifully." However, as Claire Tomalin , the author of Dickens: A Life (2011), has pointed out: "Fanny... was not going to be a star; there was no question of her becoming an opera singer, and she cannot have earned much." Fanny married a fellow musician, Henry Burnett, in September, 1837. Burnett was a non-conformist, and their is evidence that Dickens did not like his religious views. The couple settled in Manchester and after the birth of her first child, Harry, in 1839, she gave up her musical career. Harry was physically disabled and was the model for Paul Dombey, in Dombey and Son. Peter Ackroyd the author of Dickens (1990), has pointed out: "Those who seek reasons for the ubiquity of that name in his fiction might start their search here... On that criterion alone his response to the name is, to say the least, somewhat ambiguous; there is Fanny Dombey, the doomed mother of little Paul who dies in childbirth, but then of course there is also Fanny Squeers, the grotesque and ugly daughter of the famous Yorkshire schoolmaster. And then - in between, as it were - there is Fanny Dorrit, the imperious and petulant elder sister of Little Dorrit. There are also eight other characters who bear the same name. Now there is no doubt that Dickens did use Christian names which for some reason were emblematic for him - that is why the names of his father and sister crop up so often-and there is no doubt, too, that this was on occasions a deliberate device. But the range of Fannies in his fiction is so great that it suggests at the very least a most complicated relationship with his sibling. But we know also that, for Dickens himself, the relationship between brother and sister became the paradigm for human relationships in general; that loving sexless union of siblings is commemorated again and again in his novels." In 1846 Fanny was diagnosed with tuberculosis. Charles Dickens persuaded her husband to bring Fanny and her two boys to London, where she would have the support of the family and the best doctors. In April 1848, Fanny was too ill to continue with her teaching. Dickens went to see her virtually everyday. and afterwards he told his friend Thomas Mitton that she was dying, "and not by very slow degrees". Dickens later said: "I asked her whether she had any care or anxiety in the world. She said no, none. It was hard to die at such a time of life." Fanny told her brother that she was distressed about leaving her children but she believed that she would see them again in heaven. A friend said "he was moved, and impressed by her calmness and courage". 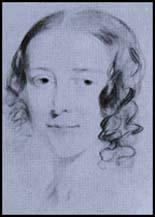 Fanny Dickens died of tuberculosis of the lung, aged 38, on 2nd September, 1848. She was a Dissenter and had asked to be buried in unconsecrated ground in Highgate Cemetery. Her first son, who had always suffered from poor health, died soon afterwards. In this period he was educated with his slightly older sister, Fanny, and those who seek reasons for the ubiquity of that name in his fiction might start their search here (the name itself might have been given added resonance by the presence of Aunt Fanny living in the house with them). On that criterion alone his response to the name is, to say the least, somewhat ambiguous; there is Fanny Dombey, the doomed mother of little Paul who dies in childbirth, but then of course there is also Fanny Squeers, the grotesque and ugly daughter of the famous Yorkshire schoolmaster. And then - in between, as it were - there is Fanny Dorrit, the imperious and petulant elder sister of Little Dorrit. There are also eight other characters who bear the same name. Now there is no doubt that Dickens did use Christian names which for some reason were emblematic for him - that is why the names of his father and sister crop up so often-and there is no doubt, too, that this was on occasions a deliberate device. But the range of Fannies in his fiction is so great that it suggests at the very least a most complicated relationship with his sibling. But we know also that, for Dickens himself, the relationship between brother and sister became the paradigm for human relationships in general; that loving sexless union of siblings is commemorated again and again in his novels, whether it is in an idealised bond such as that between Ruth Pinch and Tom Pinch in Martin Chuzzlewit, or whether it is as an element in those childish relationships which Dickens loved to describe. There are times when he becomes almost maudlin on the subject, and throughout his prose one hears as if in echo the words of one brother left behind on earth after his young sister has died: "Oh, sister, I am here! Take me!" It would not be going too far to say, then, that this image of the platonic bond between brother and sister - truly platonic, in the sense that for Dickens it seems to mirror some heavenly unity and harmony - is the dominant image of beneficence in his account of the relations between the sexes. And we will come to see its presence, too, in the relationships which he himself formed in his adult years.